The church is widely known for their radical views on a plethora of topics. Infamously known for their use of speech against the LGBTQ community, U.S. soldiers, Jews, Muslims, and more, the WBC is recognized as a hate group by both the Anti-Defamation League and the Southern Poverty Law Center. They have also been involved in several controversies in the past, from picketing at funerals to praising the Boston Marathon bombings. In this particular instance, they came to Claremont for the main sake of protesting a Pomona College class titled, “Queering Childhood.” As a result, the church issued a news release announcing their picketing at CHS at 6:20 a.m. and Pomona College at 7:15 a.m. on November 12. Protesters of all ages could be seen gathering in support of the church on the morning of November 1, including 13-year-old Bethany Hofenberger. Although the Westboro Baptist Church came to CHS in clear offense of a Pomona College-offered class, there seemed to be multiple underlying messages. This was fully articulated by protester Shirley Phelps-Roper, a well-known activist and spokesperson for WBC. She came to the picket with signs reading “God sent the shooter,” referring to the recent Thousand Oaks bar shooting, and “God’s Fury,” depicting a house on fire, referring to recent fires and home losses near Malibu, California. Phelps-Roper’s views generally express the idea that all of these events — shootings, natural disasters, and more— are God’s way of punishing humanity for the sins of the LGBTQ community. All in all, the announcement of the WBC protest shocked CHS students and left many feeling uncomfortable, targeted, and confused. This, on top of the early-morning scheduling, made WBC church members outnumber the amount of CHS students that showed. Things were a bit different when the group made their stop at Pomona College, however. Pomona College students and other Claremont residents gathered on the Pomona campus to counter the WBC members. Many were sporting rainbow attire and holding signs decorated in a rainbow font, one reading “Did any of y’all read the bible?” Fortunately, both groups remained peaceful. 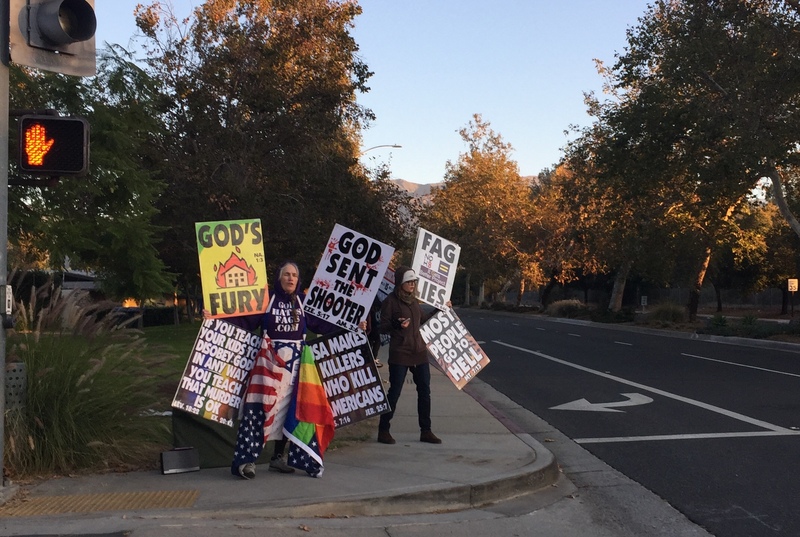 By 8 a.m., the WBC had left Claremont and was well on their way to their next Southern California picket location. In the days following, tension and confusion lingered in conversations among Claremont residents regarding the event. And the top-selling artist of 2018 is…death?